S I G N & D I G I T A L G R A P H I C S • October 2014 • 51 that are intended for printing to inkjet printers. The printer's RIP automatically converts the RGB image to CMYK using very specific algorithms making man- ual conversion unnecessary (and often destructive). If you print a CMYK image, the algorithm will first convert back it to RGB, then to LAB then back to CMYK again—creating a real mess. 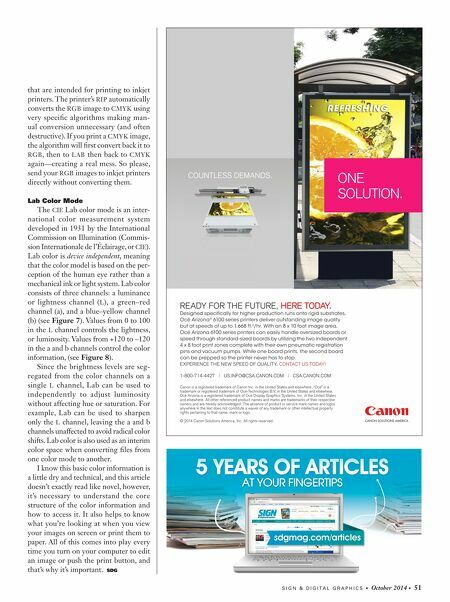 So please, send your RGB images to inkjet printers directly without converting them. Lab Color Mode The CIE Lab color mode is an inter- national color measurement system developed in 1931 by the International Commission on Illumination (Commis- sion Internationale de l'Éclairage, or CIE). Lab color is device independent, meaning that the color model is based on the per- ception of the human eye rather than a mechanical ink or light system. Lab color consists of three channels: a luminance or lightness channel ( L), a green–red channel (a), and a blue–yellow channel (b) (see Figure 7). Values from 0 to 100 in the L channel controls the lightness, or luminosity. Values from +120 to –120 in the a and b channels control the color information, (see Figure 8). Since the brightness levels are seg- regated from the color channels on a single L channel, Lab can be used to independently to adjust luminosity without affecting hue or saturation. For example, Lab can be used to sharpen only the L channel, leaving the a and b channels unaffected to avoid radical color shifts. Lab color is also used as an interim color space when converting files from one color mode to another. 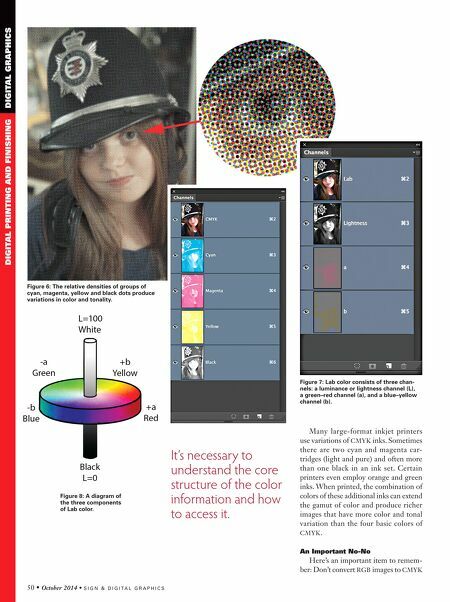 I know this basic color information is a little dry and technical, and this article doesn't exactly read like novel, however, it's necessary to understand the core structure of the color information and how to access it. It also helps to know what you're looking at when you view your images on screen or print them to paper. All of this comes into play every time you turn on your computer to edit an image or push the print button, and that's why it's important. SDG ONE SOLUTION. COUNTLESS DEMANDS. READY FOR THE FUTURE, HERE TODAY. Designed specifically for higher production runs onto rigid substrates, Océ Arizona ® 6100 series printers deliver outstanding image quality but at speeds of up to 1,668 ft. 2 /hr. With an 8 x 10 foot image area, Océ Arizona 6100 series printers can easily handle oversized boards or speed through standard-sized boards by utilizing the two independent 4 x 8 foot print zones complete with their own pneumatic registration pins and vacuum pumps. While one board prints, the second board can be prepped so the printer never has to stop. EXPERIENCE THE NEW SPEED OF QUALITY. CONTACT US TODAY! 1-800-714-4427 | US.INFO@CSA.CANON.COM | CSA.CANON.COM Canon is a registered trademark of Canon Inc. in the United States and elsewhere. "Océ" is a trademark or registered trademark of Océ-Technologies B.V. in the United States and elsewhere. Océ Arizona is a registered trademark of Océ Display Graphics Systems, Inc. in the United States and elsewhere. All other referenced product names and marks are trademarks of their respective owners and are hereby acknowledged. The absence of product or service mark names and logos anywhere in the text does not constitute a waiver of any trademark or other intellectual property rights pertaining to that name, mark or logo. © 2014 Canon Solutions America, Inc. All rights reserved.